Table Tennis | Khelmart.org | It's all about Sports. In this blog we have listed Stag Table Tennis Rubbers. After reading this blog buyers can easily take a wise decision and easily check the Rubbers features. We have putted all the features of table tennis Rubbers. Buyers can easily buy the table tennis Rubbers according to his/her need. In this blog we have listed Stag Table Tennis Racquets. After reading this blog buyers can easily take a wise decision and easily check the product features. We have putted all the features of table tennis racquets. Buyers can easily buy the table tennis racquet according to his/her need. It is latest and top end model by stag. It is made of Balsa Carbon ply which is considered as one of the best table tennis blade for professional and advance level game. Balsa Carbon ply give lightweight, rigid and well balanced table tennis racket by which player will dominate in game. Due to higher end model, player will get maximum power, control and speed during game. With this racket, player will feel empowered and will get more opportunities to improve the game. With 120 speeds, 110 Spin and 70 controls, this ITTF (International Table Tennis Federation) approved TT racquet is a perfect option for advance players. Stag Balsa Carbon Gen II/TEC Table Tennis Racket is latest model by stag and equipped with advance features. It is top selling table tennis racquet in complete stag table tennis racket series. Players with offensive playing style like to play with this racket because it gives flexibility to dominate in game with surprise attacks. In long rallies, player with Stag Ninja attack will have upper hand in all fields. Player can effective place drive shots, forehand and back shots. With perfect racket balance, player can surprise the opponent with fast racket handling. It is ITTF (International Table Tennis Federation) approved racket which is manufactured by state of art manufacturing facility of Stag at Meerut. This Table Tennis racket is developed with signature style of legendary Table Tennis Player Peter Karlsson . This racket will give you a deadly combination of offensive defense. With latest Ninja fire and Ninja attack rubbers, this TT racket will provide you perfect blend of offensive playing style while it will enhance your key defensive skills. Player with Stag Peter Fire Table Tennis bat will dominate in the game with killer spin, forehand and backhand shots. You will feel the difference in game with this racket. With this TT racket, player will get maximum power, control and spin. With 115 speeds, 105 Spin and 93 controls, this ITTF (International Table Tennis Federation) approved TT racquet is a perfect option for tournament level players. It is latest and top end model by stag. It is made of Balsa Carbon ply (Both end of ply is coated with carbon) which is considered as one of the best table tennis blade for professional and advance level game. Carbon ply give lightweight, rigid and well balanced table tennis racket by which player will dominate in game. Due to combi carbon surface at both ends, players will get maximum opportunities to hit powerful shots, offensive drive and forehand shots. With 120 speeds, 110 Spin and 70 controls, this ITTF (International Table Tennis Federation) approved TT racquet is a perfect option for advance players. Stag Combi Carbon Gen II/ Tec is latest model by stag and equipped with advance features. It is top line TT bat which is designed for advance and professional TT players. With combination of Speed and spin, you can surprise your opponent and dominate in game. In long rallies, this TT racket will provide you added advantage by which you will feel empowered and confident and as a result best of you game will come in critical game play. With good racket balance and dynamic, it is offensive TT bat for professional tennis players. It is ITTF (International Table Tennis Federation) approved racket which is manufactured by state of art manufacturing facility of Stag at Meerut. It is a top line TT bat which is designed for professional players. It comes with a supreme balance which will give you more speed, control and spin. This TT racket is specially equipped with tech rubber on the handle which will help to reduce the vibration of tennis racquet. In long rallies, this TT racket will provide you added advantage by which you will feel empowered and confident and as a result best of your game will come in critical game play. With this TT racket, player will get maximum speed, control and spin. With 120 speeds, 110 Spin and 98 controls, this ITTF (International Table Tennis Federation) approved TT racquet is a perfect option for Professional players. It is a top line TT bat which is designed for intermediate players; this racket is designed under the guidance of Peter Karlsson. The racket comprises of Peter Karlsson Blade and this TT racquet is specially made by Peter Karlsson Tec Rubbers. Ninja Power Table Tennis Racquet is equipped with soft rubber which will help to decrease your reaction time. With good racket balance and dynamic, it is offensive TT bat for intermediate players. 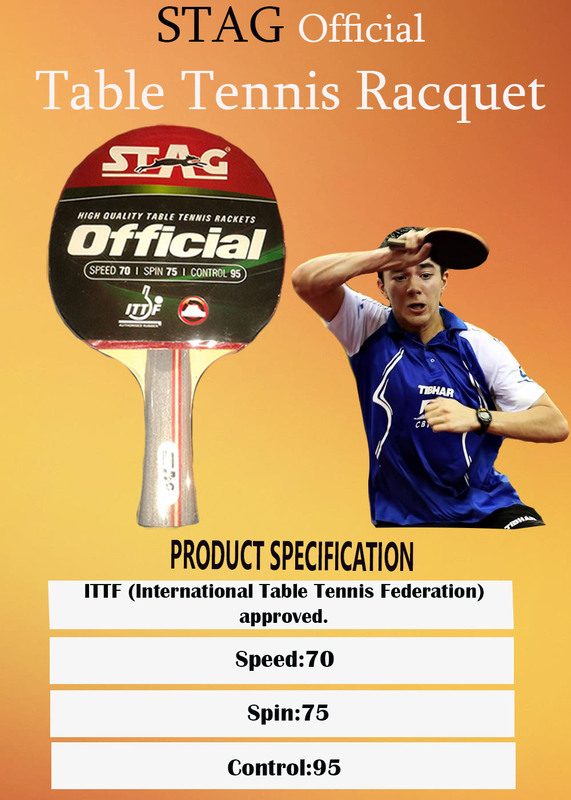 It is ITTF (International Table Tennis Federation) approved racket which is manufactured by state of art manufacturing facility of Stag at Meerut. This is the latest TT bat from Stag. It is equipped with thick ply and superb quality rubber which delivers perfect balance and spin. TT Player can dominate in the game with the help of this table tennis racket. With latest design handle, this racket will deliver you great control and perfect gripping actions. Player can change the side of the racket easily and put variation in stoke. With softer side, you will get better spin and control. This Table Tennis racket is designed to give you the perfect blend of spin and control. It is designed for intermediate to advance level of table tennis players for professional game use. With this TT Racquet, player will get maximum power, control and spin. 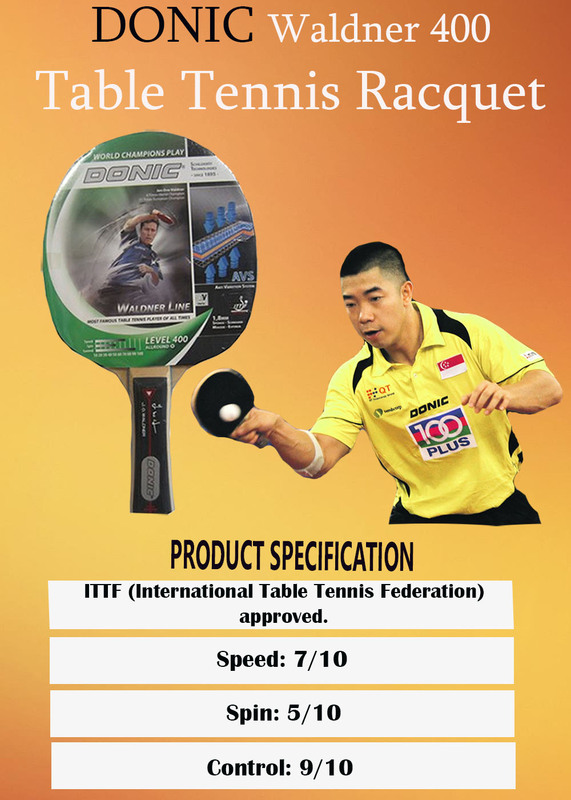 With 85 speeds, 90 Spin and 80 controls, this ITTF (International Table Tennis Federation) approved TT racquet is a perfect option at economical price range. Stag All Round Table Tennis Racquet is equipped with rubber grip which will provide you optimum gripping action for attacking game. It is thick racquet which will provide you maximum speed and players can perform the better shots like top spin and forehand shots. This is most popular table tennis racquet in complete stag table tennis racket series. It is most popular racket because of its qualities. This racket gives best performance with offensive playing style while it holds perfect during core defensive techniques. Player can effective place drive shots, forehand and back shots. With perfect racket balance, player can surprise the opponent with fast racket handling. It is ITTF (International Table Tennis Federation) approved racket which is manufactured by state of art manufacturing facility of Stag at Meerut. 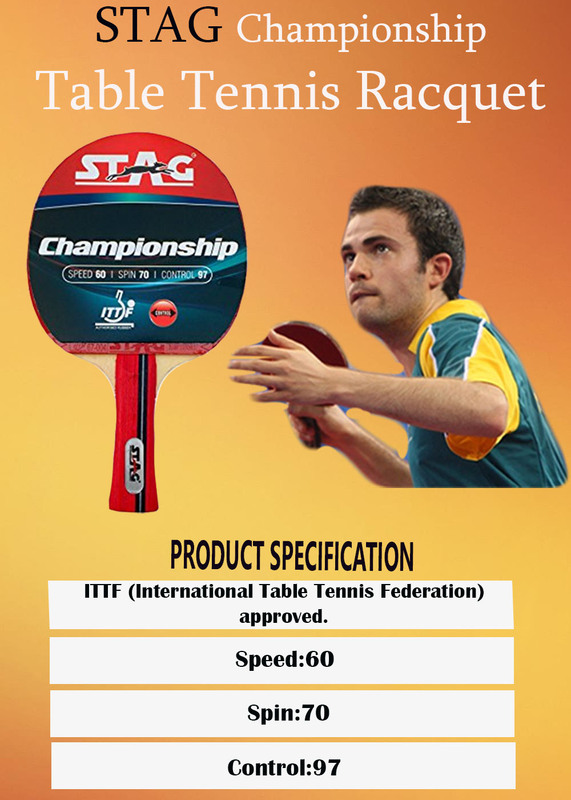 Stag International Table Tennis Racket is comes with Speed-80, Control-90, spin-75 Rating. These configurations along with enhanced rubber material & superb quality blade will give you a balance between power and control. Its blade is made of fine quality wood which gives perfect stiffness and ensures the better control on tennis ball. With better control, player can effectively place the ball to opponent side. This Table Tennis Racquet is equipped with specially designed grip which give super fine comfort and player can quickly adjust the Racket to meet the pace of the game. This racket comes with plastic protective cover which will give proper packing and ensures that racket will be safe from wear and tear. 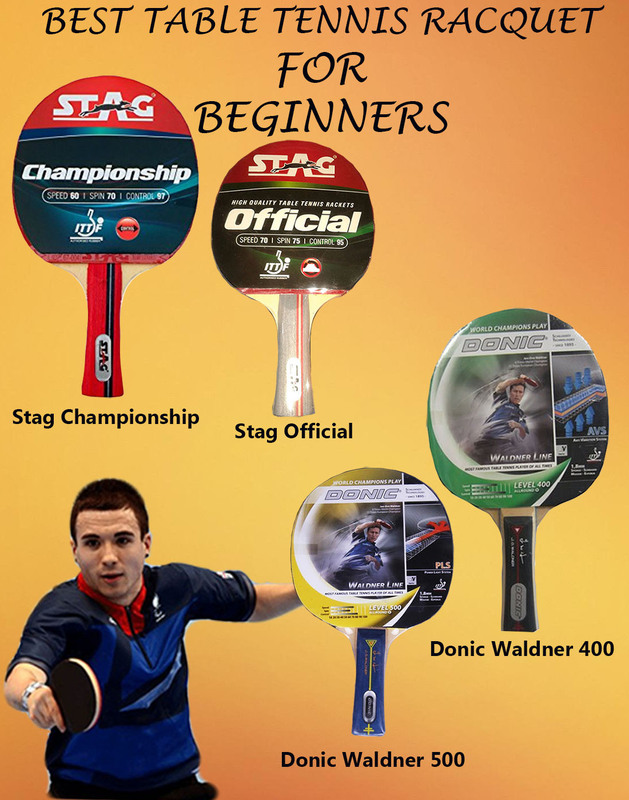 In this blog we have listed all the stag table tennis rackets. This blog will help the table tennis players in identifying the technical difference in these rackets. Moreover, it will give you a clear picture of table tennis racket performance on different technical parameters. Buyers can take wise decision after reading this blog.